Born in Bloomsburg, Betty Lou Baker is the author of numerous children's books dealing with the history of the Southwestern U.S.
Born in 1928, Betty Lou Baker started writing children’s books only after her son was born. While reading him stories, her interest was spurred. She wrote books that were based on both fact and fiction, and also made Native Americans the subjects of her stories. She died on November 6, 1987, in Tucson, Arizona. Betty Lou Baker was born in Bloomsburg, Pennsylvania, on June 20, 1928, to Robert Weidler Baker and Mary (Wentling) Baker. Baker attended school in Orange, New Jersey before acquiring an array of different jobs. Her early jobs included writing anacrostic crossword puzzles, assembling xylophones, working as a dental assistant, and owning a gift shop. In 1947, Baker married Robert George Venturo, with whom she had a son, Christopher Patrick Venturo. It was not until his birth that she realized she wanted to write. She gained interest in children’s books while her son grew up. Her son’s boring history book sparked one of her first ideas to create something better. In 1962, Baker’s first two books, The Sun’s Promise and Little Runner of the Longhouse, were published. The next year, Killer-of-Death (1963) was published and also won Baker her first award, the Western Heritage Award. Besides authoring children’s books, she instructed and lectured groups on writing for children. She was a member of the Western Writers of American and also worked as an editor for their monthly magazine, The Roundup. She also held membership in the Arizona Press Women organization. In 1965, Baker and Venturo were divorced. Baker continued to write and turned to writing about the Native American way of life. She trained herself to be a highly disciplined writer who wrote at least five thousand words a day. 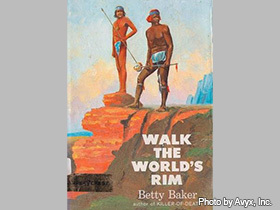 In addition to writing what she knew about the Native culture, Baker also occasionally included a small section in the back of her books distinguishing fact from fiction in her stories. In 1966, she received the Spur Award from the Western Writers of America for Walk the World’s Rim (1965). The Western Writers Award for fiction was given to her in 1968 for The Dunderhead War (1967). Once again, in 1970, she received the Western Heritage Award for And One Was a Wooden Indian (1970). Her final award, the Children’s Book Showcase Award, was given for Dupper (1976) in 1977. Betty Lou Baker died on November 6, in 1987, in Tucson, Arizona. The Sun’s Promise. New York: Abelard-Schuman, 1962. Little Runner of the Longhouse. New York: Harper, 1962. Killer-Of-Death. New York: Harper, 1963. Walk the World’s Rim. New York: Harper, 1965. The Dunderhead War. New York: Harper, 1967. And One Was a Wooden Indian. New York: Macmillan, 1970. The Big Push. New York: Coward, 1972. The Spirit is Willing. New York: Macmillan, 1974. Dupper. New York: Greenwillow, 1976. The Great Desert Race. New York: Macmillan, 1980. And Me, Coyote! (Indian folktales). New York: Harper, 1981. Rat is Dead and Ant is Sad (Pueblo folktale). New York: Harper, 1981. “Betty Lou Baker.” The Gale Literary Database: Contemporary Authors Online. 2 Sept. 1998. 4 Mar. 2001. <http://www.galenet.com>.